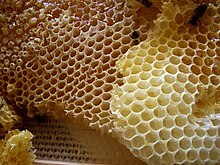 A honeycomb is a container made by bees out of wax that they produce. The bees make a honeycomb as a place to keep their honey. Bees make honey from nectar that they collect from flowers. After bees collect nectar from flowers, and make it into honey, the bees then put the honey in the small six sided areas of the honeycomb. Each hexagonal section tessellates with the rest. Honeycomb wax can be used for making soap and candles. Some people eat honey that is still in the honeycomb. A worker bee grows wax in its abdomen. The wax appears as little spots. The bee pulls it off with its legs and chews it until it becomes soft. The wax is then used to make cells for the honeycomb. Smaller cells are used to raise worker bees. This page was last changed on 8 February 2017, at 14:12.